Data continues to come in that bolsters the notion we've had that things were better than most have thought. Employment numbers are bad in the aggregate, but have been "less bad" and the trend is improving. GDP numbers were reported and were positive, and housing and retail sales are showing upticks. For the last several months we've had a stance that things were getting better and therefore we needed to hold our nose and be invested even if it was based on the theory that the improvement might be short lived and based on the efforts of the Fed's liquidity flood and the Treasury's devaluation of the dollar. What has occurred? Well, exactly what we expected! While many folks were doubting the turn, we've seen it and now the numbers are coming in to prove it out. IS THAT PRIDE I'M HEARING? Does this mean we can rest now? Actually, no, this is the time when we need to be more aware and perhaps begin looking further out to clarify our strategy through the end of the year and the first quarter of 2010. As you might expect, employers are squeezing more effort and productivity from their workers. This week the government also released productivity data showing that American workers are more 9.5% more productive in the 3rd quarter. How are we achieving these gains? FEAR! Yes, what a powerful motivator it can be in the teeth of a recession. We are willing to work harder, longer, and cheaper to avoid losing our incomes. The market loved this data point, I'm not so sure it is a good thing in the long run for the US economy. The Weekly Leading Indicators continue to show improvement. It will not be long before the recession is declared over and we'll need to somehow continue to convince ourselves that despite 10% unemployment the good times are here again! I know, I know, employment is a lagging indicator and therefore will always lag a recovery. As I've explained previously, much of the WLI data is focused on the liquidity in the system and clearly the FED has provided liquidity. Therefore we'll have to keep trusting the Fed playbook that the liquidity that substantiates the recovery will stay sloshing around for banks and Wall Street to pump up asset bubbles. Rail traffic continues to improve. Tonnage is still well below last year's rates however we are clearly in an uptrend. If we continue on trend, we will see weekly traffic exceed those handled in the fourth quarter of 2008. We need to get used to this as comparisons between year's will be very easy for the next two quarters. This statement will cover many areas of the economy, not just rail traffic! In specific areas we are beginning to see upticks in actual shipments. For example, last week grains and food actually exceeded shipments for the same week in 2008. We see this happen again in food and chemicals this week. The reason I post the lumber pricing is that I'm watching this as a leading indicator of an uptick in construction. Of course we'll see this manifest itself in construction starts and even the rail data, but it is important to try to determine if we are seeing real improvement. It is notable that there was a recent spike in pricing over the last week or so. 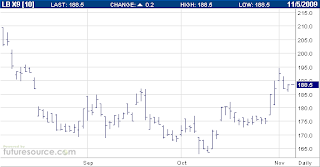 The Financial Conditions Index took a spill over the last week. It enjoyed a mild recovery today, but the improvement clearly waned over this period. We need to watch this data for indications of trouble in the bond markets. The US Dollar became a bit firmer over the last couple of days, but I am in no position to call a turn in the dollar's descent into the depths. As I've shown in PUBLIC ENEMY #1 - DEFLATION , our Fed and Treasury are absolutely committed to resolving concerns about deflation with inflation. As a last resort, Ben Bernanke has stated that a currency devaluation has been successfully used to combat deflationary forces, and could be used again. I do not think there is any doubt that we are currently employing every possible means to attack deflation and the intentional destruction of the dollar's value against other currencies is now the primary weapon being used. Yes, I'm watching that upturn and will report immediately if I see a continuation of this reversal. Remember, because much of the basis I have for investment is based on dollar weakness, if we see strength, we need to quickly exit our positions in commodities and overseas holdings. A rising dollar will typically hurt all of these. Investor sentiment has fluctuated wildly over the last couple of weeks. I was very concerned as market participant bullishness spiked, but the recent decline in the markets of approximately 4% to 5% has quickly turned many more investors bearish. Remember, we typically want to be on the opposite side to the trade when most folks feel really happy about the market or really gloomy. I'm more happy staying with these trades that there is fear back in the market. The FOMC (Fed) meeting occurred on Wednesday and we received word that they Fed will not increase Fed Funds Overnight lending rates. As we've discussed, there was no chance that these guys would hike rates and frankly there is little or no chance of that happening until the middle of 2010. Fed critics have often cited that the double dip crash of 1937 was caused by an overly aggressive Fed that raised rates too soon. As rates rose, the stock market dropped approximately 38%. Bernanke is the expert in depression Fed actions and we can rest assured that he will not duplicate the mistake. This Fed believes that they can manage the inflationary risk and would rather try to deal with that issue than a deflationary one. FHA Rules Changes - I cannot find a link to the story, but heard that beginning December 15th, the FHA will adjust the % of your income that is used to calculate the maximum loan you may receive. The current rate is around 65%, apparently that maximum monthly income amount will be reduced to around 45%. The impact of this change if correct will be to reduce the amount of house that you can afford if you are obtaining an FHA loan. During October we saw our trend continue where dollar weakness lead to increases in commodity and equity markets. As the dollar firmed, we sold off a bit which served as a consolidation to move back to highs. During that phase the indicators of fear (volatility) rose dramatically and that gave us significant pause as a spike in the VIX over 30 can warn of a significant sell off in equity markets. During the last 3 trading days though, we've recovered dramatically and are now below 25 on the VIX indicator as I type. This return to "bullish levels" and the readjustment investor sentiment away for all out greed reaffirms our notion to keep trading as we have. As the dollar goes, so will we trade! We say this with conviction, but do not misunderstand that our attention and concern is hightened. We are seeing gold at new highs, the dollar at recent lows but trying to show some strength, and many other stock indicators showing that we are near levels where the market gains should be consolidating or rolling over. I do use another indictor for trying to determine investor sentiment and have received permission from him to link to his website. Please consider Guy Lerner's site http://www.thetechnicaltake.com/ . Guy does an awesome job of looking at techincal indicators and always has excellent analysis. I am so happy that he has begun providing his insight for free as he previously had a service that charged for his analysis! I view his site everyday and I suggest that you follow it as well. Guy's research often includes a review of positions of hedgefunds and investors in the Rydex Bullish and Bearish Funds. By examining the assets in the funds he can get a sense for how bullish (greedy) or bearish (fearful) sophisticated investors are at a given point and time. Recent findings show that investors are mixed rather than leaning one specific direction. As with the AAII sentiment indicator, when investors are really leaning toward one side, we should probably bet against them. In the future, I will post Guy's charts in the place of the AAII sentiment numbers or right alongside them. Please check his site out, it is a great read. In the next couple of days I will highlight my longer term investment thoughts (meaning the next 6 months). I started to post them here, but I've realized that many of my posts are really long and I need to break them up!